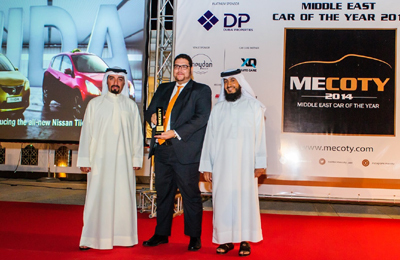 The Nissan Tiida, from the Japanese multinational automobile manufacturer’s fleet, has won the ‘Best Hatchback of the year’ at the ‘Middle East Car of the Year’ awards (Mecoty), which recently took place in Dubai, UAE. The ceremony was attended by top automotive industry players from around the region. “Mecoty is the region’s most reputed awards organisation in the automotive industry and Nissan is always delighted to be recognised by this organisation,” he said. “Nissan is committed to delivering innovation and excitement and winning this award at Mecoty is a testament to that”, he added. Nissan Tiida hatchback, was first introduced to the Middle East market in 2005, and still continues to lead the C- hatchback segment with more than 35 per cent market share, said a company statement. With dynamic styling and ample spaciousness, the second generation of the Middle East’s best-selling compact hatchback aims to build on the Tiida’s widely established success. The new Nissan Tiida hatchback comes equipped with the best-in-class fuel economy, advanced technology and various other features.